Choo choo! 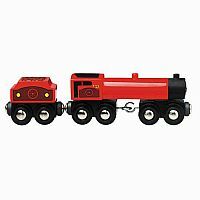 Hop on this little red engine for pretend play fun. This colorful steam engine comes with eight wheels and a realistically designed tender. It features a bright red color and authentic details. Compatible with Thomas and Friends Wooden Railway Systems and other leading wooden railway systems. Measures 7" long.